The Focal Plane Imager (FPI+) will be offered as a Facility class Science Instrument. 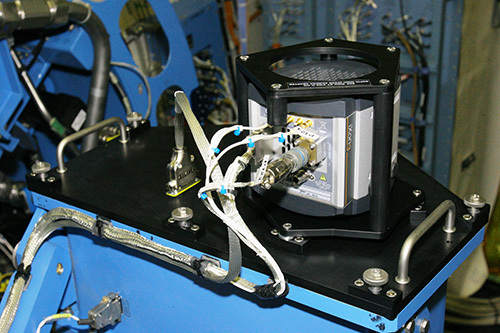 FPI+ is the standard tracking camera for the SOFIA telescope with a 1024x1024 pixel science grade CCD sensor. As a science instrument it is intended to be used as a fast frame-rate imaging photometer in the 360 – 1100 nm wavelength range. The FPI+ CCD has a plate scale of 0.51 arcsec/pixel and a square field of view of 8.7x8.7 arcminutes. Its permanent installation on the SOFIA telescope allows for its use while any other science instrument is installed on the main Science Instrument flange. Five Sloan Digital Sky Survey filters u', g', r', i', z' and a Schott RG1000 NIR cut on filter are available. A variety of configurable readout modes of the camera allows for adaptability to the needs of the proposed observations. Information applicable to the current observing cycle, Cycle 6, can be found in the FPI+ chapter of the Cycle 6 Observer's Handbook. Those submitting proposals for Cycle 7 must refer to the FPI+ chapter of the Cycle 7 Observer's Handbook. Be sure that you are referencing the correct version of the handbook!